Sometimes I think I could just change this blog to “A Fork In Each Tart”. Every time I make a tart, I devour it. I think I could eat them every single day. And there are so many different ways to make a savory tart. My favorite so far is Summer Squash and Ricotta Galette. A thisclose second is Rustic Summer Squash Tart. Both of those tarts are made with refrigerated pie crust (easy peasy!) and are so, so good that I really have to stop myself from eating the entire tart by myself in one sitting. 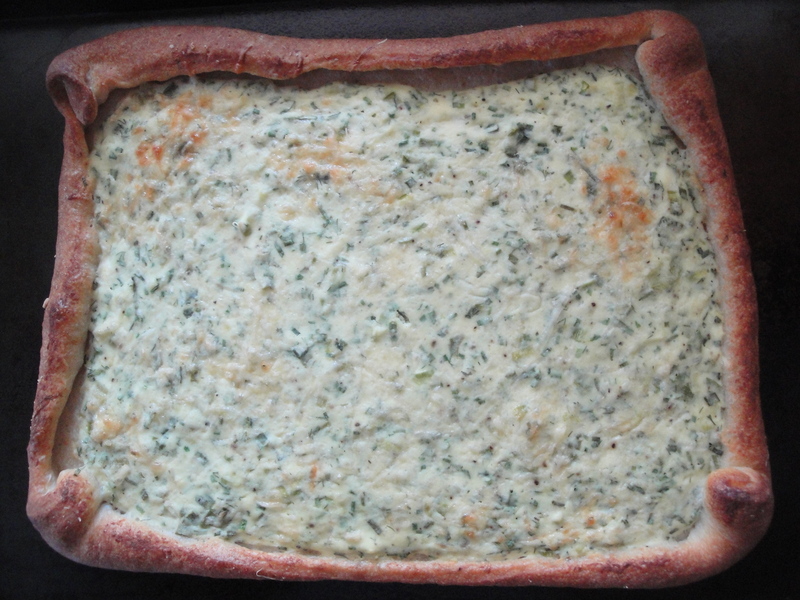 I came across this Herbed Ricotta Tart and didn’t expect it to be as good as the other two tarts because a) it uses pizza crust instead of pie crust and b) it only has scallions and herbs. But once again, yet another tart did not disappoint. I devoured this one just as easily as the others. 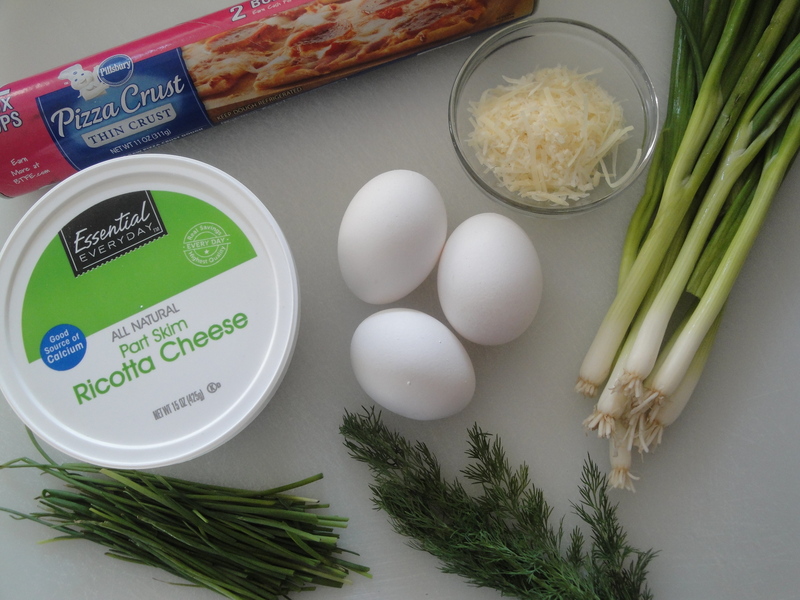 Scallions, chives and dill are mixed with ricotta and eggs, poured onto pizza dough and topped with parmesan cheese before being baked until golden brown. The scallions and chives do not overpower this vegetarian tart but instead provide a subtle onion flavor. Any herb, such as thyme or basil, would be great substitutes or additions here also. 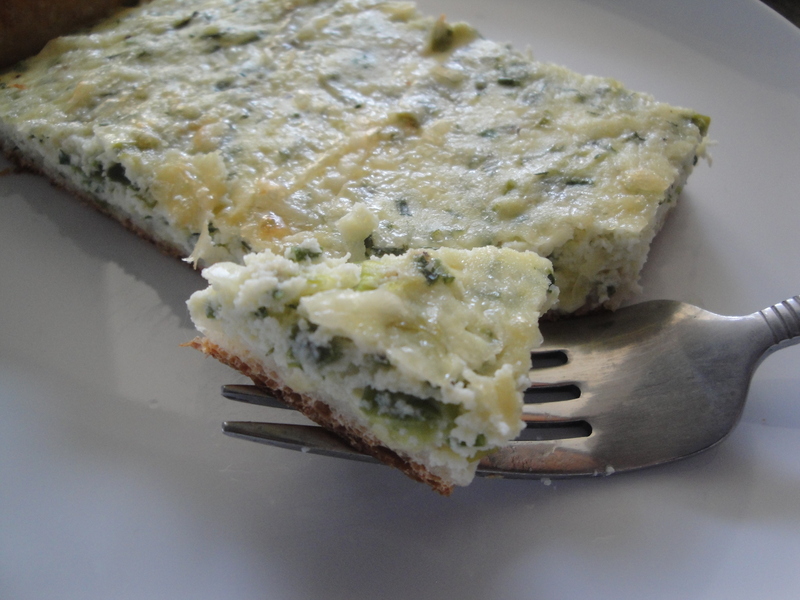 That is the great thing about tarts – any mixture of herbs and vegetables will work perfectly. And trust me, this tart is good cold right out of the fridge like cold pizza. If you haven’t jumped on the tart train yet, please get onboard. 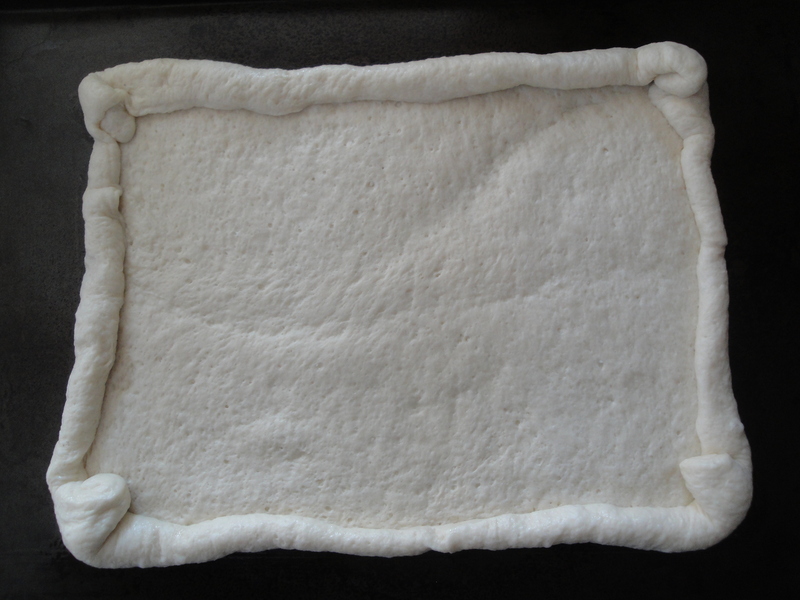 Unroll dough and press into bottom and up sides of a 9-inch round removable-bottom tart pan coated with cooking spray or mold into a square or circle, carefully rolling up the sides (as I did) onto a baking sheet. Heat a medium nonstick skillet over medium heat. Coat pan with cooking spray. 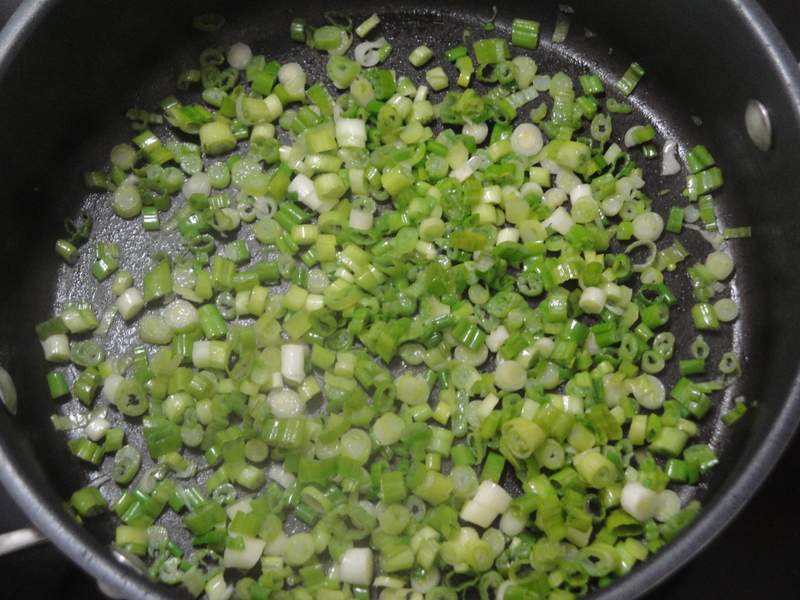 Add thinly sliced green onions to pan; cook 5 minutes, stirring occasionally. 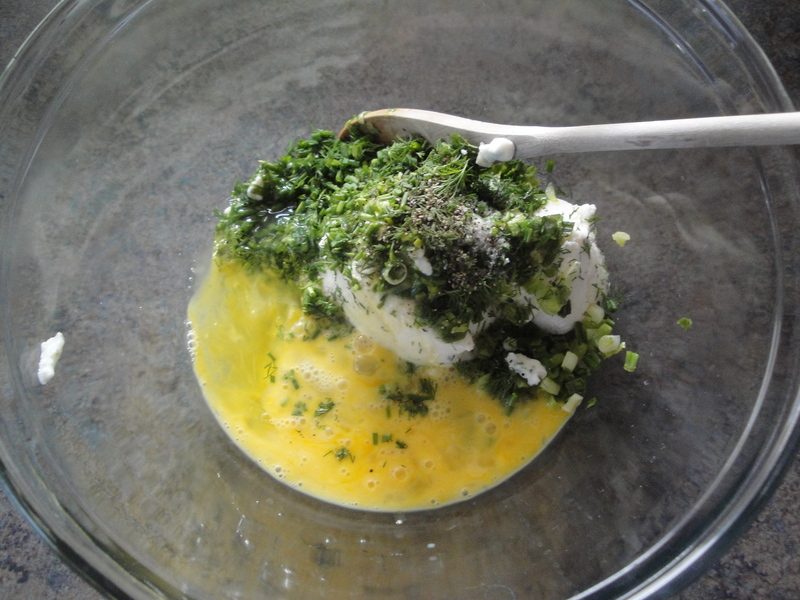 Combine cooked green onions, ricotta cheese, sliced fresh chives, minced fresh dill, salt, freshly ground black pepper, eggs, and egg white. 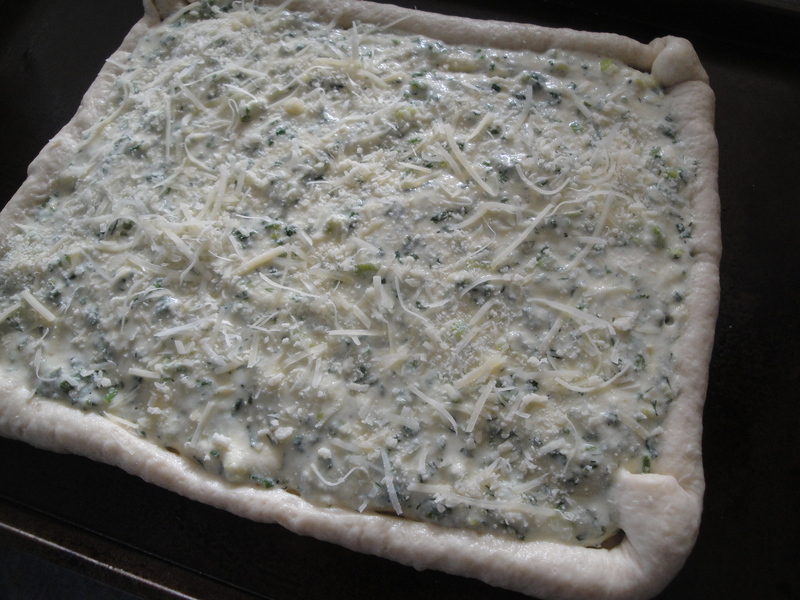 Pour onion mixture into prepared crust; sprinkle mixture with Parmigiano-Reggiano. Bake in a preheated 375°F oven for 35 minutes or until center is set. Let stand 5 minutes. Cut into 6 wedges.